HP Umpire Mike Winters ejected Dodgers Manager Don Mattingly for arguing a strike three call in the top of the 7th and Dodgers catcher AJ Ellis for arguing a ball four call in the bottom of the 7th inning of the Dodgers-Cardinals game. In the top of the 7th, with none out and two on, Dodgers batter Andre Ethier took a 2-2 fastball from Cardinals pitcher John Lackey for a called third strike. Replays indicate the pitch was located over the outer half of home plate and at the hollow of the knee (px -.23, pz 1.64 [sz_bot 1.65 / MOE 1.57]), the call was correct. In the bottom of the 7th, with one out and one on, Cardinals batter Matt Carpenter took a 3-1 fastball from Dodgers pitcher JP Howell for a called fourth ball. Replays indicate the pitch was located over the heart of home plate and below of the hollow of the knee (px -.12, pz 1.79 [sz_bot 1.73 / MOE 1.81]), and that all other pitches during the at-bat were properly officiated, the call was correct. At the time of the ejection, the Cardinals were leading, 2-0. The Cardinals ultimately won the contest, 3-0. These are Mike Winters (33)'s first and second ejections of 2015. Mike Winters now has 8 points in the UEFL Standings (0 Previous + 2*[2 MLB + 2 Correct] = 8). Crew Chief Mike Winters now has 11 points in Crew Division (9 Previous + 2 Correct Calls = 11). These are the 60th and 61st ejections of the 2015 MLB Regular Season. This is the 26th Manager ejection of 2015. This is the 29th player ejection of 2015. Prior to ejection, Ellis was 0-3 in the contest (3 SO). This is the Dodgers' 3/4th ejection of 2015, 2nd in the NL West (SD 5; LAD 4; COL 3; SF 1; ARI 0). This is Don Mattingly's 3rd ejection of 2015, 1st since May 13 (Bob Davidson; QOC = U [Replay]). 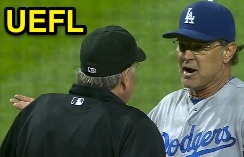 This is AJ Ellis' first career MLB ejection. This is Mike Winters' first ejection since July 31, 2014 (Mike Redmond; QOC = Y [Replay Review]).